In the Gambia, a small country overlooking the Atlantic Ocean and crossed by the river of the same name, the climate is tropical, hot all year round, with a dry season from November to May, and a rainy season from June to mid-October due to the African monsoon. 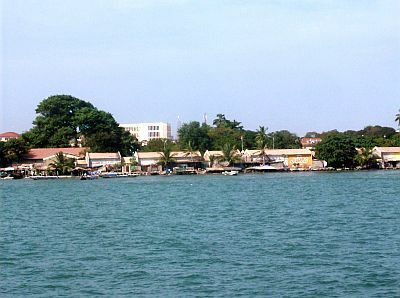 Along the coast, where Banjul, the capital, is located, the climate is tempered by the ocean, while in the interior the heat is more intense. Here are the average temperatures of Banjul. The annual rainfall varies between 900 and 1,100 millimeters (35 and 43 inches); the rainiest area is the coast, followed by the south-east. The first showers occur in June, but the rains are really abundant in July, August and September, when they exceed 200 mm (8 in) per month; August is the rainiest month, when rainfall exceeds 300 mm (12 in) in Banjul. Here is the average precipitation in Banjul. In winter, it's hot during the day, with highs around 32/34 °C (90/93 °F) on the coast and 32/34 °C (93/97 °F) in inland areas, but with peaks of 38/40 °C (100/104 °F) even on the coast. However, the air is dry and nights are cool. The wind blowing from the desert, the Harmattan, can veil the sun and lift dust. Already in February, the temperature begins to increase in inland areas, reaching 37/40 °C (99/104 °F) from March to May, while along the coast the heat is less intense, but moisture is higher. So the spring (which as regards to the temperature could be considered as the real summer) is a very hot season everywhere. With the arrival of the rains, the temperature decreases, dropping to about 30 °C (86 °F) during the day, but the humidity increases and the heat becomes sweltering. Sometimes, however, it can get very hot even in summer, in the pauses between the rainy periods. Between October and November, after the rains, the temperature rises again, especially in inland areas (see Sabi). The sun in Gambia shines regularly in the dry season, while in the rainy season the sky is often cloudy, especially in July and August. The sea is a bit cool from January to April, when the water temperature fluctuates about 21/22 °C (70/72 °F), while it's warm during the rainy season. In November, the first month after the rains, the sea is still warm. In the ocean to the west of Senegal, there is an area in which hurricanes, the tropical cyclones of the Atlantic, start to form; after they are formed, they move towards the west or the northwest and head to the Caribbean. So, usually Gambia is not affected by hurricanes because they develop at a considerable distance; however, occasionally a hurricane can be formed a short distance from the coast and affect Gambia as well, with rainfall, and storm surges which can damage the coast, as happened at the beginning of September 2015 with Hurricane Fred. Hurricanes are generally formed in this area in August and September. The best time to travel to Gambia is winter, especially the months of December and January, since already in February it gets very hot in inland areas. On the coast, the heat is tempered by the breeze, so the favorable season for a beach holiday is longer, and all in all it goes from November to May, although from January to April the sea is a bit cool. We advise against the period July-September because of heavy rains, which can cause flooding and make it difficult to travel throughout the country. In winter: bring light clothes for the day, a sweatshirt for the evening and for boat trips, a scarf for the wind-borne dust and sand. In summer: bring light clothing of natural fibers, a light sweatshirt and a light raincoat for the rain showers. It's better for women to avoid shorts and miniskirts outside of tourist resorts.